New Quibids Promo/Coupon Code – Get ANOTHER Five Free Bids! Quibids just released another new promotional code that allows Quibids players to get 5 free bids, no purchase required (as long as you’ve already purchased your first bid pack), added to your account! This promotional code expires on 10/09/2013 and is available to US customers only according to the email Quibids sent out that contained the coupon code. So go ahead and claim your five free bids and start using Bid-Ninja to start slicing through your competition and win yourself something nice! https://bid-ninja.com/wp-content/uploads/2017/08/bn_logo300x50-300x50.png 0 0 Bid-Ninja https://bid-ninja.com/wp-content/uploads/2017/08/bn_logo300x50-300x50.png Bid-Ninja2013-09-30 17:04:562013-09-30 18:28:24New Quibids Promo/Coupon Code - Get ANOTHER Five Free Bids! Quibids just released a new promotional code that allows Quibids players to get 5 free bids, no purchase required (as long as you’ve already purchased your first bid pack), added to your account! This promotional code expires on 10/03/2013 and is available to US customers only according to the email Quibids sent out that contained the coupon code. In the video below, you’ll actually be able to watch us, from start to finish, win an auction on Quibids.com using all of the available “parts” of Bid-Ninja (the analytics, the AutoBidder and the Forever Free Auction Tracker). If you don’t want to hear or see the strategy we’re using in this video and you simply want to see us win the auction, skip to about minute 5:00. For those of you who are members, you can then see how to turn a gameplay credit like the one we received for winning the auction below into an additional $30 to $60 in voucher bids on our “Win Additional Quibids Voucher Bids Cheap” blog post. 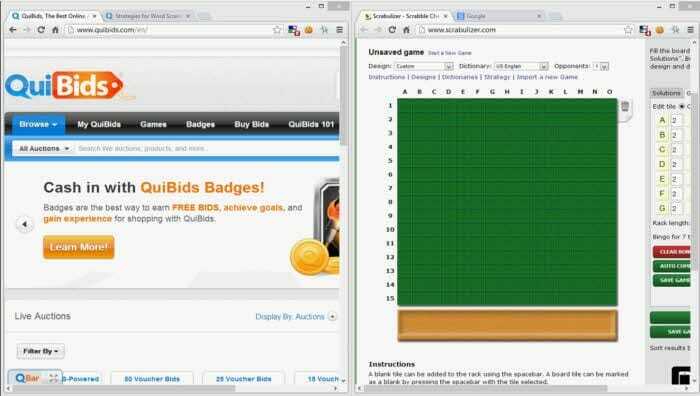 Get Quibids Voucher Bids Cheap – Get 50 to 100 Quibids Voucher Bids for $15 or Less! Below there are two videos. The first shows how we used Bid-Ninja to win a gift card auction on Quibids for just two bids and then how we used that gift card win and turned it into an additional 61 voucher bids on Quibids for absolutely zero additional investment. The first video is public and anybody can view it. The second video is members only content and NORMALLY can only be viewed by those who have a paid membership to either the Bid-Ninja Analytics and/or the Bid-Ninja AutoBidder. Until October 7th however, we’re allowing anybody to view it (you just need to log in). https://www.bid-ninja.com/wp-content/uploads/video/thumbnails/bidscheap.jpg 396 700 Bid-Ninja https://bid-ninja.com/wp-content/uploads/2017/08/bn_logo300x50-300x50.png Bid-Ninja2013-08-26 18:11:372015-05-24 20:19:41Get Quibids Voucher Bids Cheap - Get 50 to 100 Quibids Voucher Bids for $15 or Less! QuiBids announces it made the Metro50 awards list by the Oklahoma City Chamber of Commerce. Metro50 is an annual event held by the Oklahoma City Chamber and is known to be one of the city’s most prestigious events. This event recognizes the fifty fastest growing, privately-owned companies for the year, based on their percentage of annual growth. “This is an amazing award and one that we’re pleased to accept,” said QuiBids CEO, Matt Beckham. “We’ve waited a long time for this award and look forward to celebrating with all the other honorees.” The Metro50 will be held on Monday, September 23 at the National Cowboy and Western Heritage Museum at an awards banquet. The official Metro50 rankings will be unveiled that evening by Mayor Mick Cornett. Over the years, QuiBids has grown from five to 120+ employees, offering its services in eight countries and expanding, and continues to strive for excellence in its industry. It is paving the way of online entertainment shopping through a unique and fun business model. See QuiBids LinkedIn page for additional company information. The Metro 50 Award allows both emerging companies, as well as companies that have exhibited a substantial history as an established business, to be recognized. All those on the Metro 50 list demonstrate positive growth in revenues; growth in the number of employees; creativity/entrepreneurship; and business development through the expansion of facilities, customer base or markets. QuiBids is an online entertainment retail auction site that launched in October of 2009 with the mission to be the most fun way to get what you want online. Their live auctions are more exciting, reliable and safer than other online auction websites. QuiBids has been a Better Business Bureau (BBB) accredited business since 2010 and has had its bidding and shipping processes voluntarily examined by Grant Thornton. We are allowing those who live OUTSIDE of the United States full & unrestricted use of Bid-Ninja for Quibids auctions outside of the US until it is out of BETA. The BETA testing login details you’re given are for the analytics portion of our software only. We are looking for you to test our analytics and look for any bugs. We will ask that you send us a detailed email or multiple emails of your findings to support@bid-ninja.com – please include what country the Quibids auctions you’re playing on are in. User data for the analytics portion of Bid-Ninja 3.0 will be inaccurate because we just started tracking user data. The important facts for the analytics will be the bid tracker. This is typically the most important factor in trying to win any auction. Your BETA testing login details will be valid until our BETA testing is complete. We don’t anticipate this being more than a few days, as we have already tested the international release EXTENSIVELY and this is more of a formality than anything. We don’t anticipate that anybody will in fact be affected, but just in case, we ask that you please do not use or schedule your autobidder during this time frame. The Release of Bid-Ninja 2.0 is Here! The Release of Bid-Ninja 2.0 is Finally Here! We’ve listened to our customers requests and are rolling out the release of Bid-Ninja 2.0 in preparation for the upcoming holiday weekend. A new one click installation process! Chrome & FireFox have approved our plugin in their “app stores” as free browser plugins! That means you can install Bid-Ninja in a single mouseclick! The biggest new addition deserves to be told first…so here it is. We’re giving away a "forever free" version of our plugin. No need to sign up, no login details, no nothing! This "forever free" version of the plugin allows you to see ALL of the auctions Quibids has going on…even the auctions they have hidden & removed from their website! These "hidden" auctions are the BEST auctions, because NOBODY can see them except for the people who were already playing in them. This new version of the plugin will allow you to see ALL of these auctions, and you don’t even need to leave the page you’re on to see them. This new plugin adds an icon to your browser, and when you click on it, without leaving the page you’re on, you’ll be immediately shown every auction on Quibids, the number of recent bidders, the current price and a whole lot more. The “forever free” version of Bid-Ninja 2.0 is presently only available on the Chrome App Store here. It will be rolled out for FireFox within the next few days. The speed of the plugin is even faster! – One of the things most requested by our users, was an increase in the responsiveness of the application. Some of the tabs, when clicked on, had a 10+ second delay in some cases or during periods of high server load. We have completely fixed this, and now every tab and every report is BLAZING FAST! That means you’ll be able to see the data you need to see at a MOMENTS NOTICE to know the exactly right time to get into or out of an auction and steal away a win! Even more accurate reports! – Bid-Ninja has ALWAYS provided some of the most accurate data there is to be had about Quibids and it’s players…but with the increase in the speed of the application we’ve been able to "kick it up a notch" and provide even better & more accurate reports and statistics. https://bid-ninja.com/wp-content/uploads/2017/08/bn_logo300x50-300x50.png 0 0 Bid-Ninja https://bid-ninja.com/wp-content/uploads/2017/08/bn_logo300x50-300x50.png Bid-Ninja2013-03-28 03:47:162013-08-02 03:52:32The Release of Bid-Ninja 2.0 is Here!